You can plan fun breaks, great food, and live-wire after-hours entertainment, but if your conference keynote speakers aren’t absolutely terrific, your attendees will leave feeling short-changed. Speakers should be informative, of course. But they should also be so captivating and engaging, your audience won’t believe the time went so fast. More! More! How can you find stand-out speakers like that for your next gathering? Here are some things to keep in mind. What Does Make an Irresistible Speaker? They know how to read the crowd. If people aren’t responding as desired, a smart speaker can quickly detect that and adroitly switch gears or move on to reconnect. They know how to use technology. Not that tired PowerPoint, but innovative tools that foster mental and physical interaction with the audience, through real-time polls, Q&A, and comments. They know how to inspire non-tech audience participation. Savvy speakers also use techniques such as posing a question audience members can answer individually with raised hands or answer as a group with shout-back responses. Some speakers invite people up to participate in demonstrations. In your post-event survey, ask your attendees for speaker suggestions for next time. Who have they seen previously they would dearly love to hear from again? Ask industry colleagues for recommendations, too. Do an online search to build a list of possibilities, narrowing by subject knowledge. And read reviews and ratings carefully. Unless you are personally familiar with this speaker and their on-stage abilities, taking someone else’s word about them could be risky. Talk to them to get a sense of their personality and familiarity with your industry — or your company’s brand, if the conference is an internal event. You want speakers who are genuinely enthusiastic and relevantly useful. Can you find videos of prior presentations? Watch them to check out their style and how they engage audiences, but listen to note how well they tailor their content to the audience at hand. A famous name might be a big draw, but you’ll pay for the privilege. They’re also likely to do a “hit and run” performance, showing up just in time to do their thing and heading out shortly thereafter. Chances are, you can find someone just as good (or better) who will charge less and engage with your attendees off-stage as well as on. This will greatly boost overall attendee experience. Another potential challenge with in-demand speakers is scheduling. If you have your heart set on a particular person (and you have the necessary funds), consider changing your conference schedule to match their availability. But don’t let the tail wag the dog. The best speakers are as picky as you are, so give them reasons to say yes to your invitation. Explain how you’ll promote them ahead of time. Invite the press to their talk. Give them an opportunity to sign their new book (or even sell it). Arrange a VIP meal or reception. Whatever your conference keynote speakers have planned for their talk, make sure you put them in touch with your AV team as early as possible. No one’s presentation can go well if they and their technology preferences are out of sync with the rest of your event’s lighting, sound, and visuals. 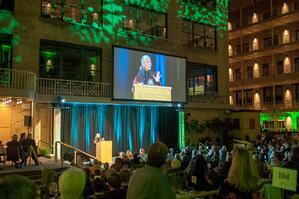 Photo Credit: Jane Goodall at “2018 Home For Life Gala,” Minneapolis. Photo by permission from Katie Thering Photography.